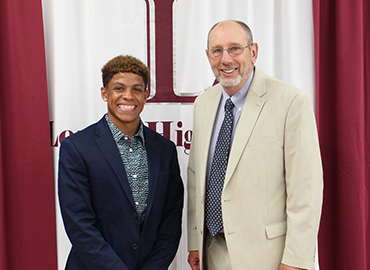 Sayid Elmoudni received The Class of 1964 Ralph Gregg Memorial Scholarship from presenter Doug Bauer. 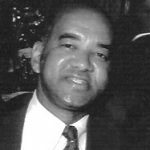 Class of 1964 Ralph Gregg Memorial Scholarship Fund memorializes classmate Ralph Gregg. Donations support the Fund’s mission to award scholarships and grants that honor Ralph’s qualities of kindness, affability, generosity, and compassion. 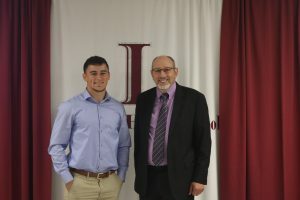 In 2018, The Northern NJ Community Foundation’s Class of 1964 Ralph Gregg Memorial Scholarship Fund’s annual award was presented to Leonia High School senior Sayid Elmoudni.